Place one tablespoon of butter and all of the bacon grease in a frying pan over medium heat. When the butter is melted add in the minced shallot and garlic. Cook for about 3 minutes or until fragrant. Stir in ½ teaspoon of salt and the flour. Cook for 2 minutes, stirring constantly. Add in diced tomatoes and mix well. Use a potato masher to crush the mixture so that it’s only slightly lumpy. Continue cooking until mixture boils. Stir in cream and brown sugar. Return to a boil. Reduce heat to low and stir in cheese, remaining ½ teaspoon of salt and tablespoon of butter. Remove from heat and stir until melted. 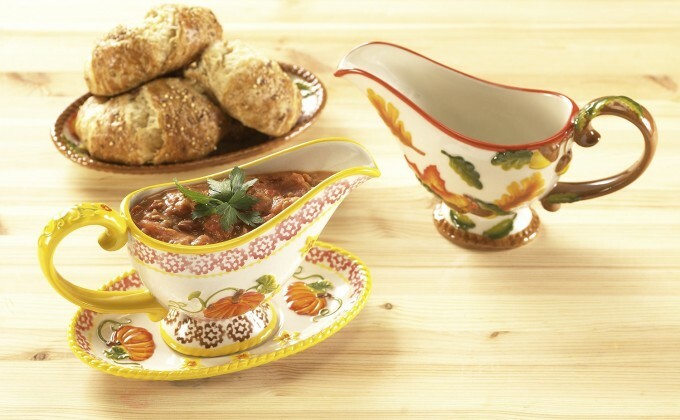 Pour into your temp-tations® gravy boat and serve hot over biscuits or pasta.